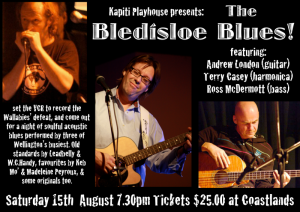 The Bledisloe Blues @ Kapiti Playhouse - Kapiti Playhouse Inc. PLEASE NOTE: Due to low ticket sales this concert has been cancelled. We apologise for any inconvenience. After years of trying to work a live performance schedule around All Black Tests and Super Rugby fixtures, guitarist Andrew London has decided to try a different approach, and deliberately offer a ‘rugby free’ alternative for those who are either unmoved by the oval ball’s adventures, or are happy to record the game and come out for some pre-match entertainment. In a show dubbed ‘The Bledisloe Blues’ especially in honour of the occasion, London has enlisted the aid of top flight Wellington harmonica player Terry Casey, and local session bass player Ross McDermott to offer a repertoire of blues classics and originals that run the gamut from old-time standards by Huddie Ledbetter, Tarheel Slim and W.C. Handy to more modern favourites familiar to fans of Keb Mo’, Madeleine Peyroux and The Fabulous Thunderbirds. ‘We’ll be showing due respect to the tradition while still ensuring a good-time vibe prevails’ says London. Terry Casey has played with numerous blues icons including Chicago Smokeshop, Darren Watson, Bullfrog rata and Laura Collins’ Backporch Blues band. Ross McDermott has a similarly impressive musical heritage having done time in bands with Jan Preston, Rodger Fox and Rob Winch, and now runs Paraparaumu’s Audiosuite recording studio. 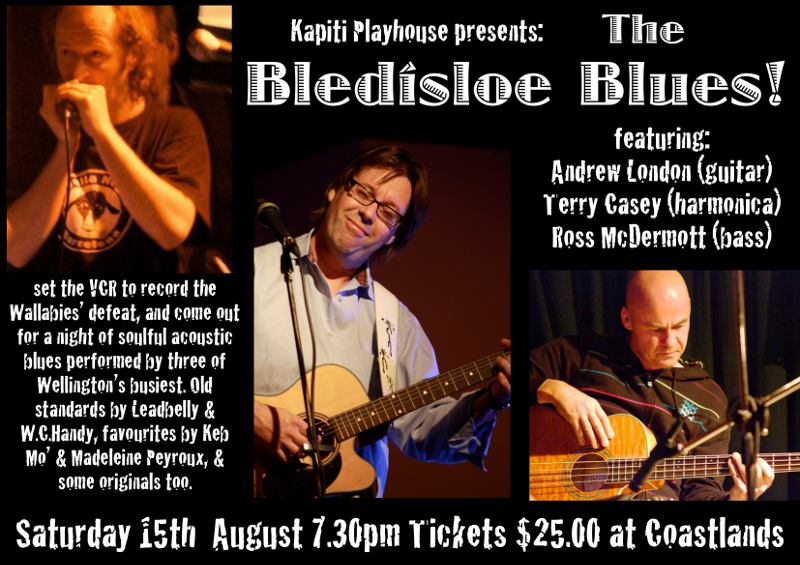 The show is at Kapiti Playhouse Theatre on 15th August at 7.30pm. Tickets are available now from Coastlands TicketDirect Information Desk for just $25.